This book is a complete guide to perennial gardening in Texas and similar regions of eastern New Mexico, Oklahoma, Arkansas, Louisiana, Mississippi, Alabama, Georgia, Florida, and the Carolinas. A perennial garden is an ever-changing source of delight. Each season brings new colors and textures in flowers and foliage. As the years go by, perennial plantings mature and interweave into forms more beautiful and surprising than a season's growth of annuals can ever give. Best of all, a perennial garden can grow almost anywhere with plants suited to local soils, temperatures, and rainfall. 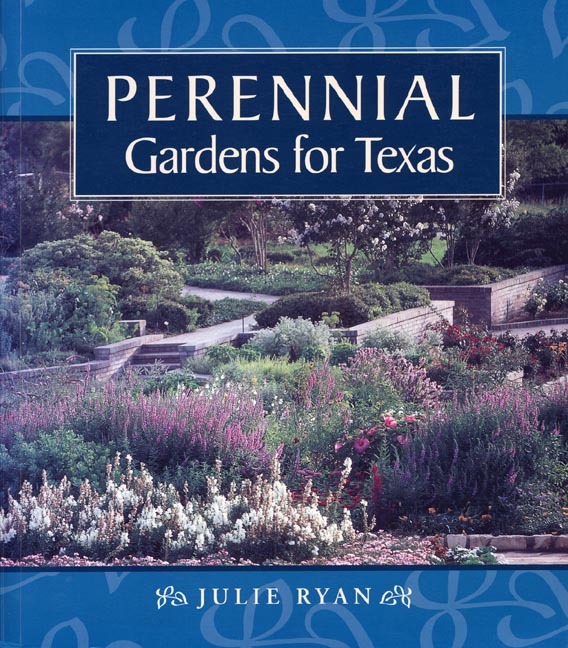 This book is a complete guide to perennial gardening in Texas and similar regions of eastern New Mexico, Oklahoma, Arkansas, Louisiana, Mississippi, Alabama, Georgia, Florida, and the Carolinas. In Part One, Julie Ryan offers a historical sketch of cottage gardens and perennial borders, with a sampler of some of their modern variations. In Part Two, she defines the major ecological regions of Texas and, with words and color photographs, takes you on a tour of lovely public and private gardens in each region. You'll find all the "how to" information for creating your own garden in Part Three. Ms. Ryan describes and pictures over 300 flowering perennials, bulbs, foliage plants, and old roses suitable for Texas gardens, with lists of companion annuals, vines, shrubs, and small trees. Accompanying charts provide quick reference to each plant's preferred regions and cultivation requirements. In addition, Ms. Ryan discusses how to design a garden and select plants, prepare the beds, and deal with garden pests. She concludes with substantial lists of resources, including mail-order suppliers of perennials, bulbs, and old roses. A well-known gardening writer, consultant, and photographer, Julie Ryan coauthored Landscaping with Native Texas Plants . She lives in Dallas. As you drive through any little Texas town, look hard enough and you will find a flower garden. Its design may seem haphazard, and the plants may be whatever the nursery had in stock or the neighbors had to share. It will contain the flowers that "do" with a minimum of fuss, either annuals newly seeded each season or perennials that regrow faithfully year after year. Some of the perennials may have grown there for twenty years, for a gardener who seasons the soil to their liking, gives them just the right amount of water, and applies a simple remedy to quell the occasional pest or disease. Some may have survived the demise of the gardener and the collapse of the house, continuing to push their blooms out through a tangle of weeds in spite of no care at all. Such flowers are the subject of this book, along with the hardy bulbs, foliage plants, perennial grasses, and old-fashioned roses that keep on keeping on. Not only old-time favorites are included here, but also myriad other plants. There are recent hybrids that are true improvements on the old garden varieties. Southern and southwestern native plants, the subjects of my first book, appear as well, including some new to the nursery trade and a few worthy ones still awaiting commercial introduction. There are also exotic plants from comparable climates of the world that our old-time gardeners knew well and others they would have grown if they had only known about them: lilies from South America, daffodils from Spain, flowering herbs from Greece. Surprisingly, books and journals of the past and conversations with elderly gardeners suggest that more plant varieties were widely known fifty years ago than the typical American homeowner with a flower bed has heard of today. Conversely, some English gardeners grew and appreciated our native plants before we did ourselves. Exotic specimens proven in their own native climates, similar to our own and as difficult, continue to make their way into the American market. First, I want to present the practical benefits and personal joys of gardening with perennials to those not yet in the know. From a practical standpoint, flower gardens in general are a boon in tough economic times. They brighten one's surroundings and boost the spirit—inexpensively. While the economic downturn of the 1980s reduced nursery sales in general, sales of blooming plants flourished. This may be because flowers in the landscape give surprising pleasure for a minimum investment, when a major landscape renovation or home remodeling eludes the budget. And perennials prolong that investment's dividends over successive years. They generally require much less labor and expense in successive seasons than annuals: dividing, at most, not clearing beds, cultivating, and replanting. And they repay the labor generously, by multiplying. They can enable a flower collection to spread from one bed to many, and to the gardens of neighbors, within a few years. Gardening with perennials offers two additional special pleasures. One is the satisfaction of observing and participating in their yearly growth cycle, from earth-hidden root to leaf and flower and back again. The other is the beauty unfolded by their year-after-year development. Perennial plantings mature and interweave at the hands of nature, the gardener, and time into forms more beautiful and surprising than a season's growth 0f annuals, however pretty, can ever give. This book is also intended to aid southern and southwestern gardeners frustrated by northeastern and West Coast publications and plant sources. Until recently, perennials suited to Texas and similar regions in other states had been given short shrift. Many books on perennials accurately reflect the best plants and proper care for gardens in New England—and California—and England! Most present ambiguities and inaccuracies in regard to Texas and the similar regions of New Mexico, Oklahoma, and the rest of the Lower and Middle South, however. Mail-order catalogs omit heat-resistant plants and label plants "hardy" that a month of summer here would shrivel. The demands of this part of the country are special. Plants must be conditioned to drought, extreme heat, and alternations of heat and cold that seemingly change seasons in an instant. They and their gardeners must withstand the metabolic stresses of summer heat that doesn't let up even at night. Gulf Coast dwellers deal with a narrower, if still high, temperature range, it is true, but they are plagued equally by difficult soils and by the special problems 0f high humidity. To date, neither garden books nor suppliers present the wide range of plants suited to these conditions. Another new tool is offered here: basic knowledge of the vegetational regions 0f the near-Southwest and the South, and of the conditions that determine which plants thrive there. Knowing something of the local soil, climate, and characteristic native plant communities not only makes home more one's own, it helps one garden and experiment more intelligently. This book presents Texas regions as models and describes their conditions in sufficient detail to provide a basis for comparison to similar regions elsewhere. Gardeners in eastern New Mexico, Oklahoma, Arkansas, Louisiana, Mississippi, Alabama, Georgia, Florida, and the Carolinas, as well as Texas, should find it helpful. Perennials presented in this book include both herbaceous perennials, which die back seasonally and then regrow from the roots, and ones with persistent woody lower stems. Some perennials need to be dug up, divided, and replanted after a year or more to thrive. Others live undisturbed for several years, even a human lifetime. A few biennials, which generally grow to blooming size the first season and flower and decline the second, are also included. As you may know, annuals, by contrast, sprout, bloom, set seed, and die in one year. Reseeding annuals appropriate to perennial gardens are listed, as well. Charming and vigorous antique roses, invaluable for their contribution to the flower garden as shrubs, climbers, and trailers, are also discussed here. So are complementary small ornamental trees and flowering and evergreen shrubs. In the pages ahead, Part One, "Gardens," gives the broad outlines of the perennial garden tradition, notes influences in Texas, and presents a sampler of different kinds of perennial gardens, from rock gardens to wildflower gardens to shade gardens, picturing colorful and widely different examples from all across the state. Part Two, "Regions," introduces the reader to the major ecological regions of Texas and important climatic influences. Each region is both described and pictured in photos of wilderness and of characteristic gardens, grand and small. The gardeners' comments on culture are included when possible. By the end of Part Two, the reader will have glimpsed some thirty different Texas gardens, from desert to bayou. Part Three, "Plants and Planting," presents more than three hundred perennials suited to the regions of Texas and related states. The plants featured are by no means all of the good ones for the regions considered. They are a selection of the most reliable and available, those slightly more tricky or rare for gardeners who want a challenge, and a few obscure ones that have been so fabulous for one ecstatic gardener that the rest of the world should hear. All are available, at least by mail order. Most are plants that thrive in several regions and are used enthusiastically by many knowledgeable gardeners. Suppositions have been weeded out to the best of my ability; if a plant is recommended for a region, it is because at least one reliable person living there has grown it and reported on it. Not all plants have been tried in all regions. Part Four includes charts that provide easy reference to the plant descriptions in Part Three. In the past thirty years, we had almost forgotten the gardens that our grandparents tended. Airconditioning drew us indoors. The demands of two careers left most families seemingly without leisure. The all-green lawns and shrubscapes of the 1950s lingered on. These circumstances did not banish our recollections or stifle our imaginations, however, nor our desire for color, charm, and fragrance in the home landscape. Now homeowners and apartment dwellers seek out plants and garden designs with just those qualities. Commercial designers are rejecting the formula of lawns, clipped evergreen shrubs, and massed annuals in favor of plantings that include perennials for the casual freedom or formal opulence they can bring to corporate landscapes. Interest in gardening, edible and ornamental, has grown, as well; it is now Americans' leading leisure-time activity. The more mechanized, noisy, and hectic life becomes, the more we seek peace in the place emblematic of both life's beginnings and its perfection: the garden. This book was written to be a guide to such gardeners, to awaken them to new possibilities. Gardens as vivid and gorgeous as any in England or France can thrive here. They must simply be achieved with different plants, and they will reflect the region's special character. The gardeners from whom I learned, including those who kindly shared the featured gardens, are old-timers. Some are young in age but have garnered the garden lore of their parents and grandparents and have themselves gardened for twenty years or more. Others first put spade to soil a half-century or more ago. I owe a special debt to my own grandmothers, who made gardens thrive in the dust storms, droughts, and blue northers of West Texas. Many gardeners who helped me in this effort had just such a mama, aunt, or granddad at whose knee their interest began. All confirmed my presentiment that gardeners include a disproportionate number of nice people to know, and that gardening naturally improves one's patience, health, hopefulness, and delight in life. A garden is a collection of surprise packages. One never knows which will open next, and every season is different. It is hoped that this book will be the first gift in a series of wonderful surprises discovered in the perennial garden: your own garden, in your locale, with plants and techniques especially suited.